Kangana Ranaut at Shahid and Mira’s wedding reception in a pink chiffon saree paired with a sleeveless blouse. 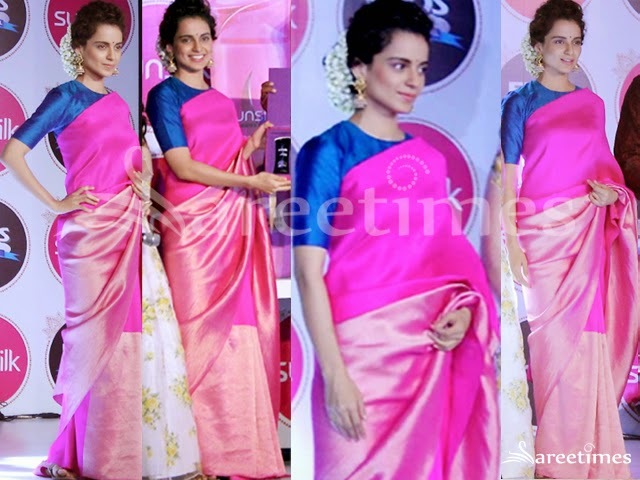 Kangana Ranaut at Sunsilk Event in a limited edition Payal Khandwala silk saree. Vidya Balan at Kangana Ranaut's party in a black Ritu Kumar saree with red and gold borders paired with black embellished quarter sleeves patterned blouse. Kangana Ranaut at a jewellery store launch in a Suneet Varma sari paired with sleeveless blouse V necked design. Bollywood actress Kangana Ranaut in beautiful a blue and gold lehenga by Sanjay Gar. She attended Amir Khan's Diwali Bash last night. Printed designs all over lehenga. Paired with designer sleeveless saree blouse with 'V' shape neck pattern. Bollywood and South Indian actress Kangana Ranaut latest saree photo-shoot. She looked beautiful in designer sarees. Bollywood actress Kangana Ranaut at Lalbaug Cha Raja For Ganesh Puja. She looked beautiful in blue silk saree with pure zari work border. Paired with designer sleeveless saree blouse with square neck pattern. Bollywood actress Kangana Ranaut in beautiful designer sarees. Bollywood actress Kangana Ranaut walked for designer Anju Modi at India Couture Week 2014. Kangana looked beautiful in embellished black lehenga. Heavy embellished patch work designs all over. Paired with designer embellished full sleeves saree blouse for back. Bollywood actress Kangana Ranaut in beautiful cream and peach designer half and half saree. Designed by Manish Malhotra at Day 1 LFW Summer/Resort 2014. Gold patch work through out border,It is a georgette fabric. Paired with designer embellished sleeveless saree blouse. Heavy embellished applique patch work on it. Bollywood actress Kangana Ranaut in beautiful tan and cream designer half and half saree. Designed by Sabyasachi at Rajjo Audio Launch. Embellished applique floral designs work all over cream net. Small sequins buttes through out border. Paired with designer quarter sleeves saree blouse with round neck pattern. Bollywood actress Kangna Ranaut walks for Birdhichand Ghanshyamdas Jewelers at IIJW 2013. Embroidered mirrors,buttes around the silver border. It is a dual color georgette dupatta. Paired with blue designer halter neck saree blouse. Embroidered sequins buttes on it. Bollywood actress Kangana Ranaut in beautiful designer bridal lehenga. Designed by JJ Valaya at the Aamby Valley India Bridal Fashion Week (AVIBFW) 2013, in New Delhi. Heavy gold embroidered thread work,embellished with applique patch work designs through out lehenga. Small embroidered mirrors around the gold border. Paired with Blue designer sleeveless velvet blouse with ‘V’ shape neck pattern. Studs around it. Bollywood actress Kangana Ranaut in beautiful green designer saree with printed and red plain border. Paired with green designer short sleeves saree blouse. Black printed work all over. Bollywood actress Kangana Ranaut in beautiful green designer silk saree at Udita Goswami Wedding Ceremony. Beautiful black printed work all over saree and black plain border. It is paired with black designer quarter sleeves saree blouse with wide neck pattern. Bollywood and South Indian actress Kangana Ranaut in beautiful multicolor designer lehenga with tan designer matching net dupatta paired with designer embroidered sleeveless saree blouse for back from designer Sabyasachi at Ekta Kapoor’s Diwali Bash. Bollywood and South Indian actress Kangana Ranaut in beautiful green designer embroidery saree with sequins buttes and embroidered border work paired with designer embellished short sleeves saree blouse with round neck pattern. Bollywood and South Indian actress Kangana Ranaut in beautiful white designer embroidery shimmer faux georgette saree with sequins buttes, mirror and embroidered border work paired with designer cap sleeves saree blouse for back with open neck pattern. Bollywood and South Indian actress Kangana Ranaut in beautiful black and white designer lehenga style saree with gold border work paired with designer embroidered short sleeves saree blouse at Bhagnani-Deshmukh Wedding Reception.